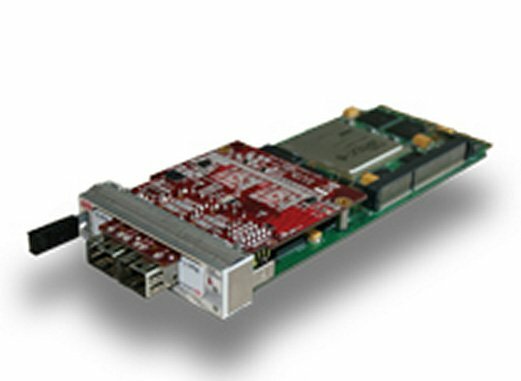 The AMC-V6-GigE is a single-width, mid-size AMC that supports two, 10 Gbps SFP+ interfaces using four, 3.125 Gbps FPGA transceivers (XAUI), and is available in a range of Xilinx Virtex-6 FPGA options (LXT/SXT), offering scalable processing performance, the most powerful resources for your OEM applications. Designed around the NetLogic Microsystems ALE2005 PHY, which interfaces to the Virtex-6 FPGA with the XAUI protocol and creates SFP+ 10 Gbps interfaces using four, 3.125 Gbps FPGA transceivers. The AEL2005 is a physical layer transceiver with an integrated electronic dispersion compensation (EDC) engine that complies with the IEEE802.3aq specifications. With its multiple clocking capabilities, the 2×10GE SFP+ can be used in limiting linear or twinaxial cabling (twinax) modes to answer the high data throughput needs of advanced Ethernet telecommunications applications. Lyrtech can support your customization and software/firmware needs should modifications be necessary to fit this product to your OEM requirements.